It’s 6am; I rise to a new day. Outside my window, a curtain of darkness hides the land. Lake Windermere is asleep under a ghostly blanket of ethereal mist, faintly illuminated by waxen light from a clear moon in a star-studded sky. I watch as the sun’s auroral rays break into the darkness and reveal Crinkle Crags, standing proudly at the head of the Langdale Valley. The valley awakens to an unexpected covering of ice and frost. The blanket of mist rises off Lake Windermere. Mountain tops display their seasonal splendour, as beams of sunlight touch them with orange fingertips. Overnight, snow had settled on Crinkle Crags. Snow-white fingers slide down its gullies and snow caps the tops. The Crags sit, sandwiched between cloud and mist; it slowly falls and rises, blends together, and draws a white curtain across the dawn landscape. I wait, and the mist slowly dissipates. The day brightens, at 7am, the Crags appear again. 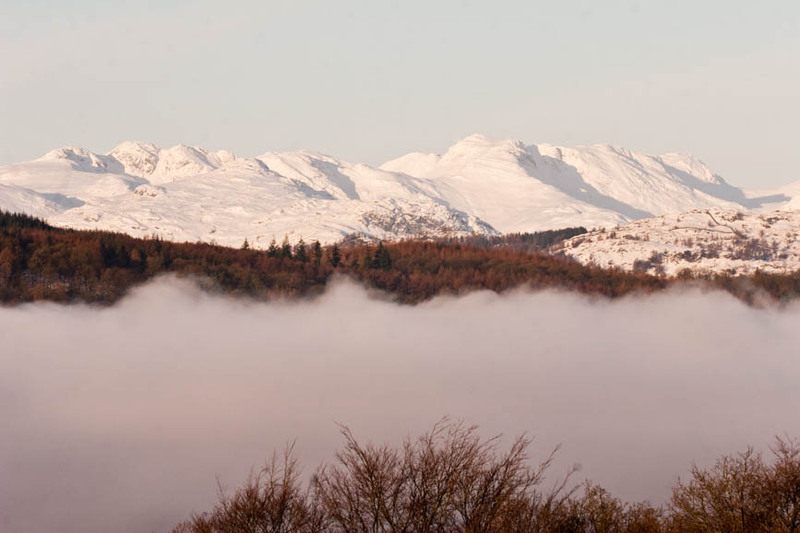 The summits of neighbouring mountains peep above the mist like knucklebones. Sunlight touches them, and slowly pours down their sides like paint, creating a canvas of colour against dawn’s grey light. Snow has settled only on the crags; the other mountains display their autumnal colours. The inky blackness of the sky slowly turns to grey and then blue, as the sun rises out of bed. It is the cold beginning of a beautiful day. The snow is the first this winter. Unexpected, because the weather had been unusually warm over the past weeks, but now the earth has felt the first bite of winter. Cold, icy fingers have stroked fields, buildings, and rock, leaving frosted patterns across the landscape. Glass panelling display winter’s artwork to inhabitants of houses and dwellings around the valley. People open doors and walk to cars covered with a white film of frost. Plastic scrapers scratch noisily through the early hours of the morning. Engines break the sound of silence, and the voices of children scream with delight at the prospect of snow and winter. The sun has risen, it warms the earth, and the frost melts, gone for the day. Mountains begin to clear of snow as the warmth of the sun pushes away the icy hands of winter. People go to work, and marvel at the sunlight, the colour of the autumn trees, and the prospect of a brilliantly glorious day ahead.